I have several quilts that my grandmother made, and oh how they are so special to me! She passed away years ago, but the love of sewing and quilting that she and my mother instilled in me will last my lifetime! My daughter is a trememdous seamstress, quilter, pattern designer — all of it, and now we are wanting to start passing along some “beginnings” of sewing to my little 3 1/2 year old quadruplet and 5 year old grandchildren (my daughters’ children). We’ve started with the sewing cards and they’re getting pretty good at running the threads in and out of the precut sewing holes. 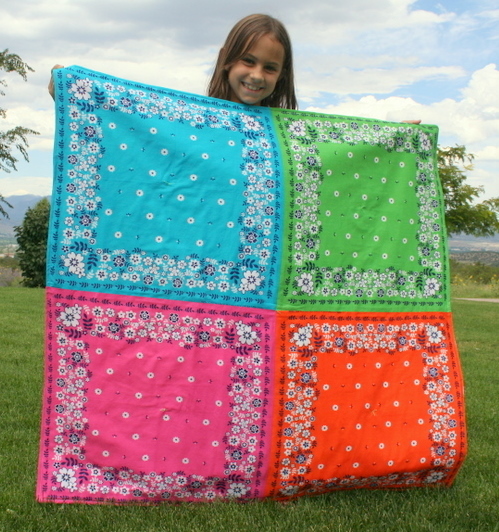 With that in mind, I want to pass along this fantastic tutorial about making a quilt with your child, that comes from Randi at “I have to say” blog — this is a wonderful idea, and using the bandanas for the quilt looks great. I can’t wait until our little ones are old enough to do something like this — I even have a box of bandanas they could choose from. 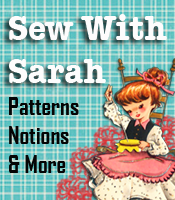 For those of you who would like to encourage some sewing interest in your children, this might be a good way to begin. For other quilting projects, you might like to check out a couple of my quilt patterns that would make good parent / child projects – our Beautiful Butterfly Quilt, the BowTie Quilt or the Patch “Puff” Quilt. Children love to see “results” from their work, and a quilt that they could show to their friends would certainly be an encouragement for them to want to make other projects.